SEOUL, March 20 (Yonhap) -- The South Korean government on Wednesday expressed regret over findings that suggested the country's second-most destructive earthquake, which struck Pohang in 2017, was triggered by a geothermal power plant. The announcement came after a state-led investigation team claimed that the 5.4 magnitude tremor in November 2017 was caused by a nearby geothermal power plant and was not natural in origin. This has led to criticism that the government did not properly carry out research before building the plant. "The government accepts the results from the investigation team," the South Korean government said in a statement, expressing its apologies to the citizens of the industrial city 370 kilometers southeast of Seoul. "The government will roll out necessary measures down the road following these results." The government said it will consider a complete shutdown of the geothermal power plant and will make efforts to repair damage caused by the earthquake. 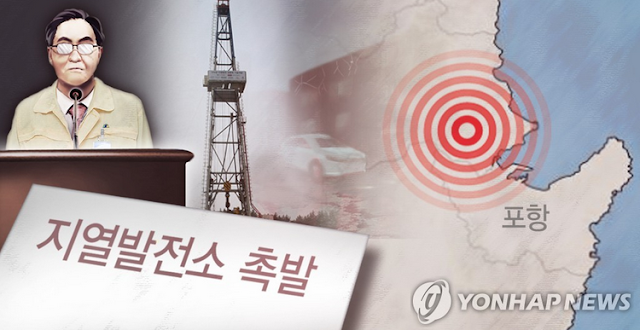 "Through cooperation with the Pohang government, we will permanently suspend the geothermal power plant project, and recover the site safely in cooperation with experts," the statement added. A geothermal power plant works by injecting water kilometers underground to turn it into steam, harnessing it for energy. Experts said this could have weakened the ground in the area, leading to an earthquake. South Korea has been carrying out tests on geothermal power plants since 2010. The Pohang plant was constructed in 2012. The earthquake in November was the second strongest observed in South Korea, causing damage worth 85 billion won (US$75 million) as well as 118 injuries.